Today (31 May 2017) the Scottish Government published a long-awaited report on the role of satellite tagging technology in monitoring the movements of birds of prey – and it’s a watershed moment in the battle against raptor persecution. The report was commissioned in August 2016 after eight satellite-tagged golden eagles went missing in the Monadhliath mountains, Scotland. It was carried out by independent scientists and subsequently peer-reviewed, and submitted it to Scottish Natural Heritage. It revealed that, of the 131 young eagles tracked over 12 years, a third (41) have disappeared – presumably died – under suspicious circumstances significantly connected with contemporaneous records of illegal persecution. These disappearances occurred mainly in six areas of the Highlands, and the majority of cases were over land intensively managed for driven grouse shooting. The report found no link between the fitting of tags and the disappearance of the birds wearing them, ruling out any connection with wind turbines and undermining suggestions that the failure of the tags (due to loss of signal or breakage) was responsible for the tagged birds disappearing. Director of RSPB Scotland, Anne McCall, said: “We commend the authors of this report for producing a comprehensive, robust and forensic examination of the issues regarding the disappearance of satellite-tagged golden eagles in Scotland. By commissioning such a review the Cabinet Secretary and the Scottish Government have shown decisive leadership, and provided a clear, factual, if very worrying picture, of the scale of illegal persecution in Scotland. "The conclusions reached by the review support the concerns that RSPB Scotland has been expressing for decades: that Scotland’s protected birds of prey continue to be illegally and systematically killed, in significant numbers, and primarily in areas where intensive grouse moor management dominates the landscape. 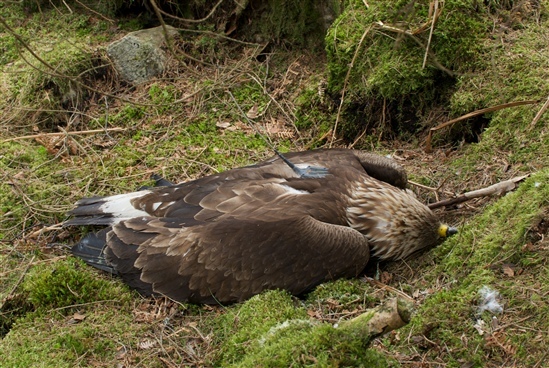 RSPB Scotland’s Head of Investigations, Ian Thomson, said: "When you add to this the disappearances of satellite-tagged white tailed eagles, red kites, goshawks, peregrines and hen harriers, not included this review, and consider that satellite-tagged birds form a very small proportion of the populations of these species, the overall numbers of eagles and other protected raptors that are actually being killed must be staggering.